Why is it called Saltaire? The village was named for its founder, Titus Salt, and its location on the banks of the River Aire. Without river valleys Yorkshire would have had no textile trade and without Titus, Bradford might not have been so successful an industrial centre. What does the village represent? Saltaire is the most comprehensive example of a Victorian ‘model village’ in the world. Its design and ethos can be linked to those of other model villages created by northern industrial philanthropy. Its layout reflects 19th century social hierarchies based on class. However, distinctions were not rigid, as promotion by merit was possible at Salts Mill. The community was one in which aspirations were encouraged and potential often was fulfilled. What drove Titus to build the village? Rejecting the ruthless philosophy of laissez-faire capitalism widely accepted at the time, Titus provided work accompanied by decent housing and social amenities. His approach reduced the social deprivation and untenable living/working conditions common under Victorian industrialisation. His humble background was never forgotten nor his fortune squandered. The Salt family motto is ‘Quid non Juvante’ (‘With God’s help there is nothing that can’t be done’). At nearly 50 years of age Titus took one final gamble to close his five existing mills in order to create the one ‘super-mill’ and the village of Saltaire. What is in the village? The village was constructed across a 49 acre site between 1853 and 1872. The rectangular arrangement had separate zones for work, play, religious practice and home life. 800 houses were built with an investment of £170,000 (another 200 were envisaged but not constructed). Accompanying the housing stock was an extensive array of amenities (estimated to have cost a further £200,000). These included 40 shops (Victoria Road), a Club and Institute (now Victoria Hall), public baths and wash house, two churches, three schools for both girls and boys, 45 almshouses for the elderly and a hospital. Further developments were scheduled in the form of a hotel, an indoor market and abattoir but Titus had to adapt his vision to rather more modest plans as ill-health halted him. During 160+ years, the uses of the village buildings have reflected the economic development of Britain as a whole. As a result many buildings have been adapted, but very few have disappeared. The model village and the mill are highly valued today but this was not always the case. By the 1960s a family home was expected to be larger and more comfortable than a Saltaire cottage. Decline in the textile trade meant far fewer jobs at Salts Mill. The railway station closed in 1965. The lowest ebb came in 1985 with the closure of the mill. Campaigns to revive the site and preserve its heritage found limited success. Bradford Council considered plans to all but level the village as part of local redevelopment. Roberts Park could have become a four-lane highway. 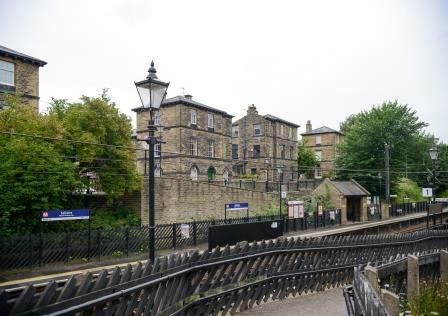 Several factors combined to save Saltaire, including local campaigning, the reopening of the railway station in 1984, and Jonathan Silver’s 1987 purchase of the mill. Criterion(ii): Saltaire is an outstanding and well preserved example of a mid-19th century industrial town, the concept of which was to exert a major influence on the development of the “garden city” movement. Criterion(iv): The layout and architecture of Saltaire admirably reflect mid-19th century philanthropic paternalism, as well as the important role played by the textile industry in economic and social development.